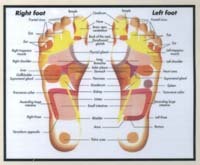 Reflexology helps to regulate the body systems by promoting homeostasis, a harmonious balance of calm & well-being. Very relaxed, often relieves emotional pressure. Used in the treatment of mild depression. Also to promote nerve function to help relive Parkinsons. a fascinating science & an extremely effective form of therapeutic foot massage.